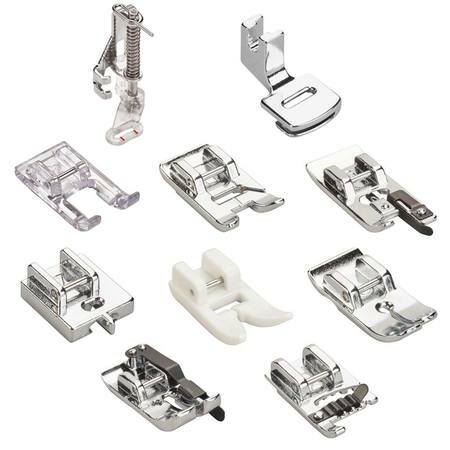 This presser foot kit includes one of each of the following feet: Non-Stick Zig Zag Foot, Straight-Stitch Foot, Overlock Foot, Invisible-Zipper Foot, Embroidery Foot, Open Embroidery Foot, Gathering Foot, Cording Foot, Patchwork Foot, and Darning/Embroidery Foot. Overlock Foot: The Overlock Presser Foot will form the stitches over the pin. This feature will allow for more evening stitching and will prevent thread from puckering. Invisible-Zipper Foot: To properly install an invisible zipper, you must have an Invisible Zipper Foot. As the zipper coils are guided through the tunnel system, the needle sews as close to the coils as possible. This easy-to-use foot ensures your zippers are finished professionally and rival that of any high quality garment. Embroidery Foot: This embroidery / darning foot is used for free motion sewing and is ideal for sewing satin stitches, appliques, adn decorative stitches. Open Embroidery Foot: Clear Plastic allows you to see your work as you go. It is also great for applique work. Open bottom channel allows decorative work to flow through. Patchwork Foot: A popular foot with patchworkers for that essential 1/4 inch seam. The guide on the foot enables you to sew a perfect 1/4 inch seam every time. The guide can also be used wherever a 1/4 inch seam is called for but the markings on the needle plate cannot be used, such as when completing a flat seam.